Remember "Wag the Dog"? Stage a war to win votes? Julius Caesar got there two thousand years ago with his war for Gaul. ASU's Jim O'Donnell has a fresh new translation that tells all — about the political machinations, the FUBARs, and who really won the war. Imagine a book about an unnecessary war written by the ruthless general of an occupying army "a vivid and dramatic propaganda piece that forces the reader to identify with the conquerors and that is designed, like the war itself, to fuel the limitless political ambitions of the author. Could such a campaign autobiography ever be a great work of literature "perhaps even one of the greatest? It would be easy to think not, but such a book exists "and it helped transform Julius Caesar from a politician on the make into the Caesar of legend. 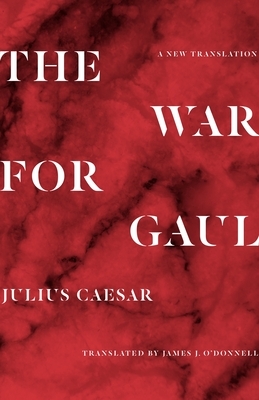 This remarkable new translation of Caesar's famous but underappreciated War for Gaul captures, like never before in English, the gripping and powerfully concise style of the future emperor's dispatches from the front lines in what are today France, Belgium, Germany, and Switzerland. While letting Caesar tell his battle stories in his own way, distinguished classicist James O'Donnell also fills in the rest of the story in a substantial introduction and notes that together explain why Gaul is the best bad man's book ever written: "a great book in which a genuinely bad person offers a bald-faced, amoral description of just how bad he has been. Complete with a chronology, a map of Gaul, suggestions for further reading, and an index, this feature-rich edition captures the forceful austerity of a troubling yet magnificent classic "a book that, as O'Donnell says, gets war exactly right and morals exactly wrong." Jim O'Donnell is a scholar, innovator, and leader. He has taught ancient history at Bryn Mawr, Cornell, Penn, Georgetown, and now ASU, and published widely on the history and people of the ancient world. He went on to become vice provost for computing at Penn after teaching the first MOOC in history, then he was provost at Georgetown for ten years. He came to ASU in 2015 to join the leadership team of the most innovative university in America as University Librarian, but he still teaches as well. His trade books include Avatars of the Word: From Papyrus to Cyberspace (Harvard 1998), Augustine a New Biography (HarperCollins 2005), The Ruin of the Roman Empire (HC 2008), and Pagans (HC 2015).